Preparing yourself and your vehicle before towing isn’t it just a matter of hitching up and hoping for the best! You would think that was the mindset of towers out on the road as the majority seem to have faulty tail lights, debris flying out of uncovered trailers and think that towing other vehicles is carried out using a strap. Towing a car, caravan, horse float or trailer can turn pear shaped very quickly if you don’t know what you’re doing, and reversing can be challenging for even the most experienced drivers. Here are some tips to make your towing venture as hassle free as possible. First of all you should be aware of the stress towing spots on a vehicle. The transmission, chassis, brakes and engine have added stress due to the extra weight and force on the vehicle. If you are towing a camper van, boat or trailer you do need to make sure the vehicle is prepared. There are towing limit restrictions on vehicles and you should know what the towing capacity is for your vehicle before you attempt to hook up. If you tow an object that is too heavy or too large for your vehicle you can be fined or worse it could cause an accident and your insurance company will refuse payment if you are over your towing capacity. When buying a vehicle make sure it will be able to handle what you anticipate you might need to tow in the future. If you tow frequently your vehicle may need to undertake extreme/adverse condition servicing. This means your car may need to be serviced more regularly and certain fluids and components checked or replaced more often. Public weigh bridges are a great place to find out the how heavy your tow load is. If you are loading your vehicle up and also loading up a caravan, boat or trailer then be aware of the added weight and make sure you stay under your load limits for the vehicle. You should also check that your registration is up to date and the towed object is registered. When purchasing a vehicle for towing, bigger is generally better as larger cars are manufactured to handle more stress. There are particular 4WD vehicles that are designed to handle heavy loads such as Toyota Land Cruiser, Land Rover Discovery and Nissan Patrol. Other mid-size 4WD’s such as the Toyota Prado or Nissan Patrol have reasonable towing capacity, and some people find the Commodore or Falcon family sedan more than capable. For regular towing, a turbo diesel engine offers increased torque, and reduced fuel consumption. Smaller 4 cylinder petrol engines may be able to handle light loads, but they will struggle with more substantial loads and are definitely not suitable for heavy loads. Before you drive off with a load, make sure to check your vehicle’s tyres are inflated correctly and that you have the required tools and a spare, should you need to change the tyre on the caravan or trailer. Is there a safety chain? Check the coupling and safety chain where it attaches to the vehicle. 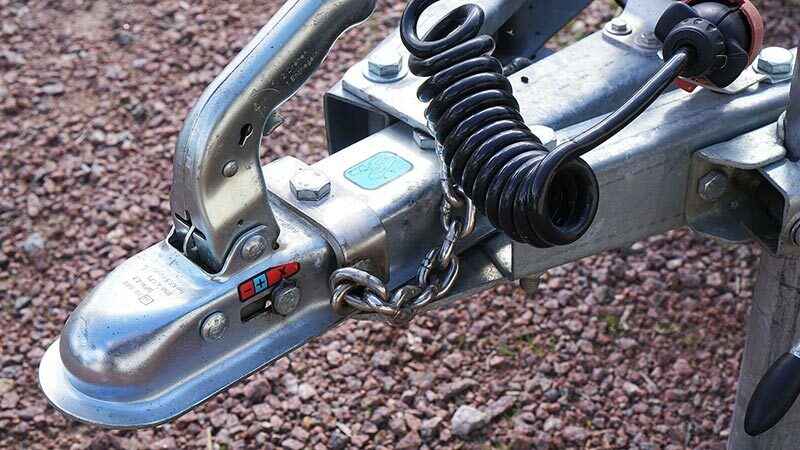 All trailers must have a safety chain attached to the vehicle in case it accidentally uncouples. This keeps the trailer with the vehicle so it doesn’t suddenly become a dangerous moving object travelling free on the road. If the towed object has its own brakes, it’s your responsibility to ensure their safe and correct operation. Check all electrical components are secure and operational, making sure all the lights, including hazard lights, are working correctly with and without your foot on the brake pedal. Sometimes your indicators may work but not if you put your foot on the brake and vice versa, so check all scenarios. If you are towing a trailer with items inside, you are responsible for covering and/or securing your load. If anything falls or flies out of your trailer you can be fined for littering or worse you may be liable for damages caused from projectiles coming from the trailer. All items need to be secured and covered so nothing leaves the trailer whilst on the road. Do not overload a trailer or have objects projecting past the sides of the trailer in a dangerous and illegal manner. Ideally loads should be distributed, evenly spreading the load so there is not more weight at the front or rear. You should also consider the weight-distribution hitch. When towing, if the front of your car is pointing to the sky, you are either overloaded or your load is not distributed evenly, causing wear and tear and impacting steering and braking. When it comes to towing another vehicle, there are a few options. Obviously a tow truck driver should be able to manage your vehicle safely, but it can be a good idea to know what they should be doing in regards to preparing your vehicle to tow. The safest way to tow is to place the whole vehicle on a flatbed tray or car trailer, with the whole car off the road and secured. If your vehicle is to be towed with either the front or rear wheels raised with the opposite end still on the road, make sure the drive wheels are raised. So if it’s a front wheel drive, the front of the car should be raised, if rear wheel drive the rear raised and if All Wheel Drive then ideally the whole car should be off the ground. For AWD vehicles, if there is no other option and you must raise just half the car off the road, there is the option to disconnect the axles which will help prevent any possible transmission damage. If you have broken down and someone offers to tow you to safety then they must use a tow bar. This is a solid V-shaped bar that connects between the two vehicles. This is the safest and legal way to tow between two vehicles with all wheels on the road. When being towed this way you do need to use hazard lights and not travel for long distances. The towed vehicle should be in neutral or not in gear. Under no circumstances should you be towing another vehicle with a strap! This is an illegal method of towing and not a safe option. Consider the other traffic around you and pull over now and again to let people pass or to check your load is still secure and, if travelling long distances, stop to have a rest or swap drivers. Importantly if the object you are towing starts to get a sway happening do not apply the brakes. If you’re able to, continue at a steady speed or accelerate. If the caravan or trailer has independent electronic brakes you can apply the brakes very gradually. When it comes to reversing a trailer, the larger the item you’re towing the easier it will be to reverse. Use a large empty space to practise and start off trying to be positioned as straight as possible. Ask someone to help guide you and work out the best way to see the object you are towing, be it in the mirrors, over the shoulder or total reliance on your helper. The trailer will move in the opposite direction to where you are steering so if you turn left it will veer to the right. The concept is that you back the car in an arc towards where you want to go, whilst straightening the wheel at the same time. If you turn too far the vehicle and trailer will jack knife and you could cause damage if you don’t correct your angle in time. This should get you on your way to a safer towing experience. Rachel spent her early adult life around cars, motorsport and hands-on with her own cars. This interest moved into various careers within the Automotive industry. Joined with her passion for writing, Rachel loves putting the two together to share her experience, so we can all become AutoGuru’s.